openBVE arrived some time ago. You will find links to the updated Edinburgh-Aberdeen and Bo'ness branchline routes here. Upgrading will be a gradual process. First postings (August 2009) are simply openBVE compatible versions of my BVE4 routes with all the openBVE syntax errors removed. The updates of December 2009 include the new catenary wiring at Waverley and west of Haymarket and Laurencekirk station. The latest set (June 2018) includes the rebuilt Haymarket Station, the new station at Edinburgh Gateway and a huge number of scenic improvements including 4 new stations!. Some animated objects and animated trains & trams have been included as well - further refinement in this area is contemplated! All revised routes use the 2009 Scotrail or East Coast timings. Note: All main line routes require that you download Steve Green's BrSigs and Semaphore Sigs pack from the openBVE Download Extras webpage. Your comments would be appreciated! Email me with openBVE in the subject line please! The Class 47 model required can be downloaded (see below). It is best to choose a 47 model hauling quite a short train so it will not seem too sluggish when running light engine which the rescue mission does on the way up the line to Birkhill. Coming back down you are hauling a train, so it is a better simulation. Remember to read the "in game" instructions on what to do when on this run! Download the scenery file (edin.rar) and expand it into the "Object" folder so a sub-folder called "edin" is created. Similarly, download the route file (Edinburgh.rar) and expand it into the "route" folder thus creating an Edinburgh sub-folder. With these two downloads, you get all the scenery and all the scenarios. 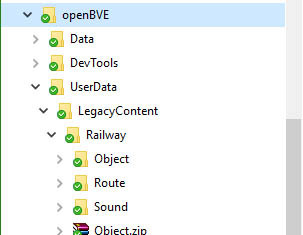 The trains to run the routes come from various third party sites - just do a search for "openBVE trains". Any train will run any route, but for best realism, try to choose the correct train, e.g. Class 37 for the 2x37 Aberdeen run. A driving tip - Ctrl+T toggles the timetable display if you find it annoying! Downloads restricted to ZIP/RAR format only.